-The nausea and I-can't-eat-anything-except-taco-supremes-from-Taco-Bell disease stopped at around 14 weeks. I've been feeling really great ever since! My appetite is back and I can eat food from our home. I spent this trimester in a love affair with Vanilla Coke and bacon - not necessarily at the same time, although that would be a pretty good idea. -We found out it was a girl a few days before Christmas. It was the best gift ever! We loved being able to share it with our families during a time that is so special already. 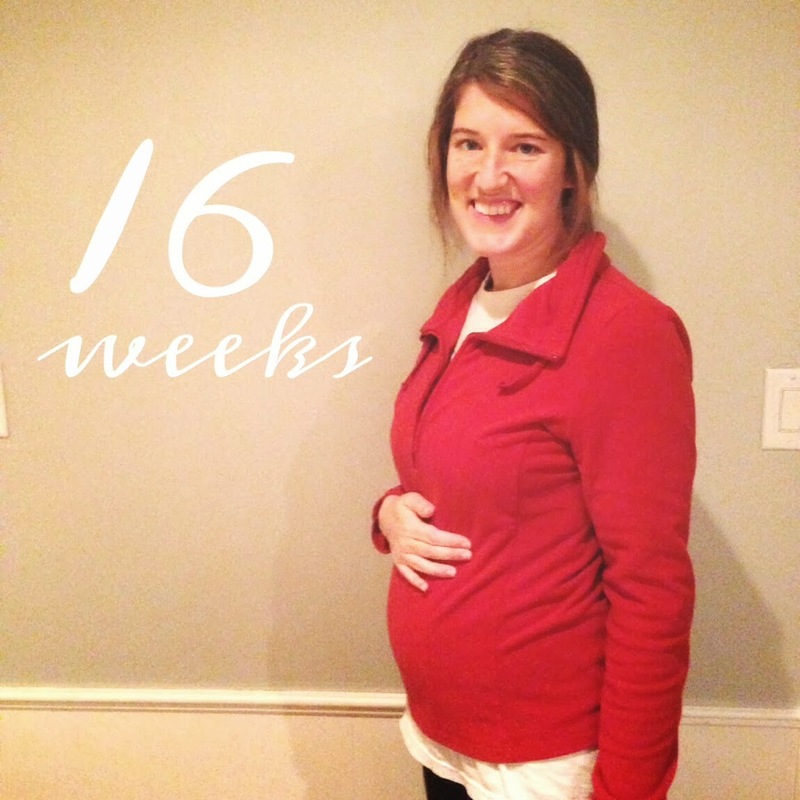 -I began feeling her move around 18-19 weeks and was feeling it consistently around 20 weeks. This is one of my favorite parts about being pregnant. -At 19 weeks, we discovered that my placenta was borderline low and that she was in breech position. I do know that she is head down now (yay!!). We will check the placenta issue in a couple of weeks. -I started feeling some Braxton Hicks contractions around 22-23 weeks. They weren't all-the-way Braxton Hicks (as in, I couldn't necessarily feel my stomach tighten from the outside), but the sensation was there. Now, I feel several legit Braxton Hicks contractions each day. -I use the restroom at least once, sometimes twice, in the night. And each time, I remind myself to soak in the simplicity of just having to get up, pee, and go right back to bed. Soon enough, I'll have full nursing sessions to attend to! -My glucose test was negative! This may be the only thing so far that has been the same for both pregnancies. My doctor did say I was a little anemic, so I've been taking an iron pill every other day. -I'm beginning to lose my mind. Not all the way, but just a little. Having "pregnancy brain" when I typically am one who remembers everything is interesting. It's manifested itself in different ways this time around. Sometimes, I can't think of really basic, everyday words. For example, I was talking to Colt a few days ago and was trying my hardest to think of the word "shampoo." I stood there, mouth wide open, eyes looking up to the ceiling, and nothing was coming out. But you want to know the first 2 words that came to mind in my search for this mystery word? "cement" and "cancer." Totally makes sense. -I love the second trimester for its crazy burst of energy it gives you! I've gotten so much more done and I really just feel like myself. I started my prenatal yoga DVD around 20 weeks, but have not been very consistent. (Like, if I did it once a week, I called it success.) I plan to ramp it up for this last trimester. I find myself oo-ing and ah-ing over new babies and I'm really excited to meet this sweet girl. However, I want every last bit of these 12 weeks so I can get all my millions of things done. I'd love it if she came naturally on her due date, just like her brother. But I have a feeling she might have her own way of doing things. :) Hurray for the third trimester!